The combustible content of rice husk is more than 70%. The calorific value of rice husk is 12560-15070kJ/kg, 1/2 that of standard coal and 1/3 of diesel. But the cost is only 1/6 of coal and diesel. Compared with oil, gas and coal, rice husk is renewable as a biomass resource. As predicted by United Nations Food and Agriculture Organization in 1971, the most practical use of rice husk is to provide energy as fuel. Rice husk takes up 20% the weight of paddy. There are 100 million tons of rice husk production every year globally, and 70% of them are not fully utilized. It is estimated that the paddy rice demand will be up to 780 million tons by 2020, so there is going to be more rice husk need dealing with. Why make rice husk into pellets? The bulk density of rice husk is as low as 100-160kg/m3. It may cause pollution to heap up rice husk outdoors. But when molded into pellets or briquettes, it become smaller in size, convenient for transport and storage. It is cleaner to burn formed pellets than bulky materials, and the burning rate is much higher. The ash content is 15-16% when burning rice husk directly, but it is decreased to less than 7% in pellet form. With small and uniform size, rice husk pellets are more convenient to use in burning device. It is cleaner than other fuels for the less smock and dust emission. Making rice husk pellets doesn’t requires much cost and high technology, so it is a efficient way deal with rice husk, which have been promoted in many areas, especially rice growing regions. In Thailand, many rice hulling mills use rice husk pellets to drive boilers. Malaysia is a leading rice producing country. It has substitute rice husk pellets for coal and oil in heating supply. In Vietnam, the second largest rice exporter in the world, rice husk has become the major material for making biofuel. The steps to make rice husk pellets includes sieving, grinding, pellet making, cooling and packing. So, the equipments required are sieving machine, hammer mill, rice husk pellet making machine, pellet cooler and packer. Of course, you don’t have to collect them all if you make pellets for self use or the production scale is small. Sieving: the sieving or screening machine can remove all impurities and dusts in rice husk so as to ensure the quality of final pellets and prevent damage to the pellet making machine. 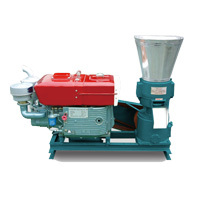 Grinding: a grinder or hammer mill can make rice husk into fine powder so that they are qualified for making pellets. 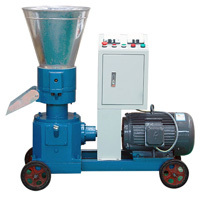 Making pellets: the rice husk pellet making machine can make the rice husk powder into molded pellets. Cooling: the temperature is high when pellets just come out from pellet machine. pellet cooler can cool them down efficiently and improve hardness. Packing: pellet packer machine can pack rice husk pellets into bags of different capacity. Packing makes it convenient for store and transport. Tips: to improve the quality of rice husk pellets, we recommend you to use binders. Or you can mix rice husk with some sawdust. It contains lignin who will melt under high temperature and help to form the rice husk pellets. Just like the function of binder. TICO rice husk pellet making machine adopts flat die design. The compression part is constituted by a press roller and a flat die. When you feed grinded rice husks into the pellet machine, they are distributed on the flat die. The roller put high pressure on the raw materials, and temperature inside rise up under high friction. There are many holes on the flat die, into which raw materials are pressed. When they are extruded from these holes, they are formed into cylinders, and cut into pellets of certain length. There are 2 ways that pellet making machine works. One is that roller rotates while the die keep stationary. The other is that the roller keep still and flat die rotates. Both D-type and R-type are able to make qualified pellets. D-type is our standard version. It is more cost efficient. R-type is pro version, with higher capacity and superior gear box, so the price is higher. Besides, we provide electric motor, diesel engine, gasoline engine and PTO 4 drive systems. TICO rice husk pellet making machine adopts compact structure, so the volume is small and the weight is light. You are enabled to move it to the rice husk heap rather than transport the materials. Besides, it adopts gear transmission system, who has higher efficiency and longer service life than belt or warm transmission. Where are rice husk pellets used? Like other wood pellets, rice husk pellets can be burned in pellet stove, furnace, industrial boiler, and other heating appliances. Nowadays, biomass pellet fuels are widely used in industrial production, power generation, home heating and central heating. In conclusion, rice husk pellets have many advantages over fossil fuel and bulky rice husk materials. If you have stable source of rice husk and want to make profit from it, making rice husk pellets is an excellent choice. If you have intention to engage in pellets production or questions on biomass business, welcome to send us enquiry in the form below.